It's a cozy place surrounded by nice people, Great for alone-traveler and friends. The staff is really great, they made the hostel a home. Thanks a lot to everyone 😘 The hostel is well located, near subways and big avenues. There are a lot of restaurants and bar in the area. The facilities were great, clean and comfortable. I am completely grateful of my staying at Aurora. Family-like atmosphere, location, staff, and great value for what I paid. A wonderfull place with an incredible energy and staff. Very good breakfast and vert cheap Price. Once you Come here its difficult to be in another hostel un Rio. the staff don‘t speak English, but that’s okay, you’ll talk through google translator for check in,.. the people in general were very open and friendly, so you’ll get a good head start there. The location is nice and safe. It was really clean! Mick, the argentinian volunteer on the frontdesk was really friendly and helpful! It was also good to find a place in such a good location for the New Years in Rio, with a reasonable price, considering it is the busiest season in Rio de Janeiro. The staff here are amazing and will do everything to make your stay enjoyable. I experienced true Brazilian warmth and hospitality here. Clean rooms, fully equipped kitchen and loads of bathrooms. If I am ever in RIO, this is where I am coming! The location is the only great thing about the place. And that's it. Very close to the metro station and bus stops. 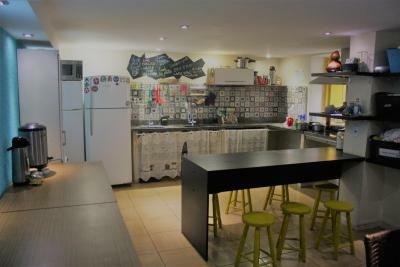 Featuring barbecue facilities, Aurora Hostel Rio in Rio de Janeiro is located 2.1 miles from Rodrigo de Freitas Lake. Among the various facilities of this property are a garden and a shared lounge. The property has a 24-hour front desk. At the hostel, rooms include a closet. Rio de Janeiro Botanical Gardens is 2.7 miles from Aurora Hostel Rio. Santos Dumont Airport is 5 miles from the property. 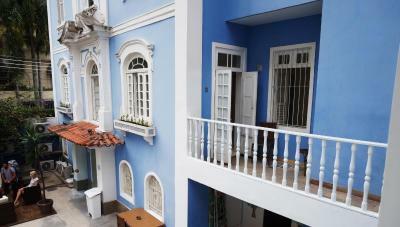 When would you like to stay at Aurora Hostel Rio? This bed in dormitory with 8 beds features air conditioning. 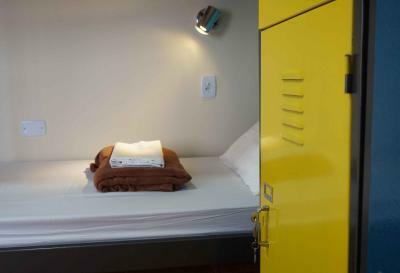 This dormitory room with 12 beds features air conditioning. House Rules Aurora Hostel Rio takes special requests – add in the next step! Aurora Hostel Rio accepts these cards and reserves the right to temporarily hold an amount prior to arrival. Sorry and unorganized. Staff did not speak English. There were wholes in the ceiling and walls. It looked partially unfinished. There were drugs everywhere. We gave our cloths to the laundry and the smell afterwards was horrible, like rotted. It seemed like all the people staying there were actually living there. 99% of the time the people were drunk of high. They were singing and listening to music 24/7. If you have a light sleep I wouldn't recommend you to stay in there. They didn't give us the room we booked and we had to move after 2 nights. The structure was not that amazing, there was a big hole in the ceiling of the room, no light, the AC didn't get to where I was, even though the hostel was full, there was no vibe and pretty much everyone was just interacting with their own crowd (but that can also be because of the New Years Eve) and the hostel seemed disorganized, without control of who was a guest and who was not and which beds were occupied or available. Well, this other site said I would get free bath towels. And I was charged for them 7 reais from some dude called Miki. I am very upset!! It was not clean. Many guests smoking made it uncomfortable. It was nice to listen to the guys playing brazilian music live. The bed sheets were used and dirty. There were pieces of cigarette on the the window and the bathroom was disgusting. They also have a box where they put the dirty clothes in the middle of the entrance. They have no sense of cleaning at all. Easily the best Hostel I've ever stayed in. The staff is amazing, the bike tour by Tiee was an amazing way to see the city with a great history of everything! 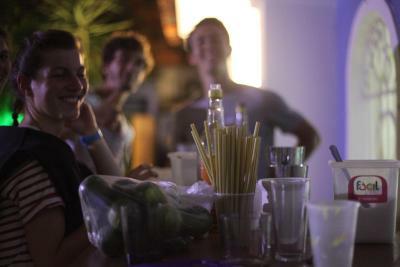 The layout of the hostel and all the events make it super easy to meet other guests and have an amazing time!